author of "Fragments: Architecture of the Holocaust, An Artist's Journey Through the Camps". Art often doesn't need a name or a word to explain something. Seventy years later there is still no “why” in the remains of the Nazi extermination camps. Artist Karl Koenig's photographs stand as haunting, evocative portrayals of the senseless evil. 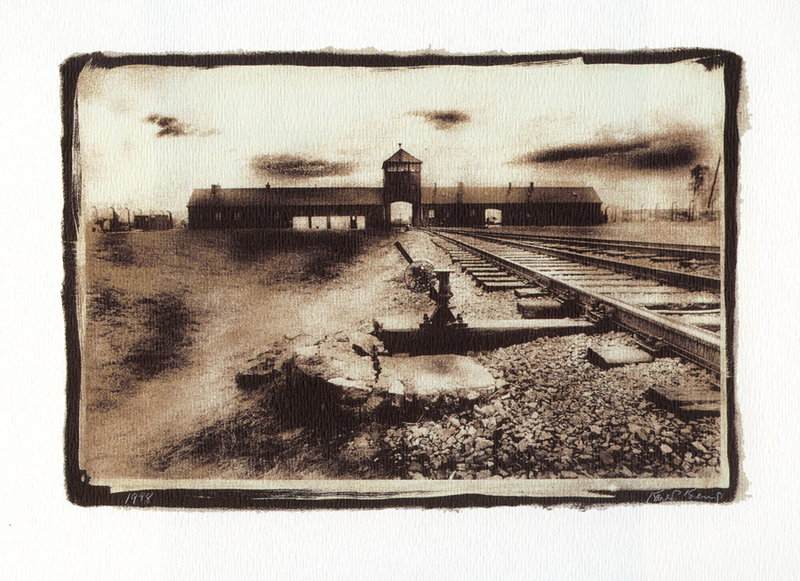 Over a span of ten years, from 1994-2004, he photographed what was left of the camps and turned those photographs into unique art works that give viewers a glimpse, a fragment, of what the camps were. Koenig was a New Mexico artist of international renown. That fame rested, in large part, on the decade of work he spent photographing the remnants of ten Nazi death camps. He was haunted by the questions raised by the Holocaust and sought answers through his art. Beginning with straight photographs, Koenig developed them into majestic, harrowing works of art using a unique printing process he invented and perfected. The end result was a transformational body of art that explores the pure evil of the camps. 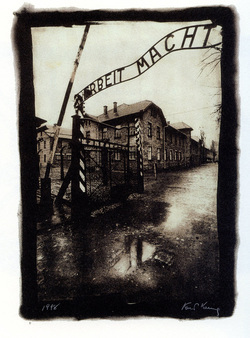 The resulting gumoil prints, each of which took several weeks to produce, are powerful photographs of the remains of Holocaust concentration camps. His work has been exhibited in galleries and museums all over the world but, never before, in his native New Mexico. Now his photographs are coming home to New Mexico. You can see them for yourself at the Albuquerque Photographers' Gallery from August 16th through September 30th. The opening reception is the Saturday evening August 16th. In addition to the original prints, shown at the Houston Holocaust Museum exhibition, a few original gumoil prints from the series will be available for purchase as will copies of Koenig's book, Fragments: Architecture of the Holocaust, An Artist's Journey Through the Camps. Albuquerque Photographers' Gallery is located in Albuquerque's Old Town at 303 Romero Street. You'll find it on the second floor, in the Northeast corner of Don Luis Plaza, across the street to the west of the church. (There is an elevator on the south side of the building.) The gallery will be open during the exhibition every day from 10 A.M. until 6 P.M.